From 10 - 15 December 2018 in the Moscow Union of Artists will open the anniversary exhibition of Ekaterina Popushoi "Fragments of Reality". The exhibition will feature paintings by the author. 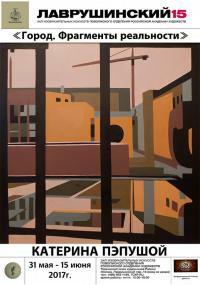 The main theme of the paintings is the urban landscape, industrial motifs. Houses, bridges, courtyards, arches, various architectural variations that build their own spaces of reality, the variety of forms and their compositional solutions, the interweaving of planes and faces, the contrasts of one over the other. Exhibition "Labyrinths and their inhabitants"
Moscow Exhibition Hall "Gallery A3"
Silver medal of the Creative Union of Artists of Russia "For contribution to the national fine arts"
She was awarded the Silver Medal of the Creative Union of Artists of Russia "For Contribution to the National Fine Arts", signed by the President of the Creative Union of Artists of Russia Khudyakov K.V. From July 15 to July 29, 2017. in the Moscow House of Artists, Kuznetsky Most 11, was held in the 34th youth exhibition, organized in honor of the 85th anniversary of the Moscow Union of Artists and the 870th anniversary of the city of Moscow. At the opening of the exhibition were present leaders of the Moscow Union of Artists and the Department of Culture of Moscow. 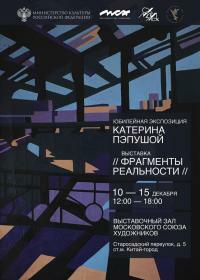 Exhibition of Katerina Popushoy "City. Fragments of reality "in the Coordination Center of the Volga branch of the Russian Academy of Arts" Lavrushinsky 15 "
From May 31 to June 15, in the Coordination Center of the Volga branch of the Russian Academy of Arts "Lavrushinsky15", a personal exhibition of a member of the Moscow Union of Artists and the Creative Union of Artists of Russia, Katerina Popushoy "City. Fragments of reality. " 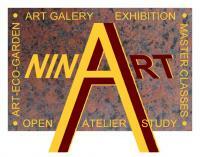 Exhibition in Finland in the gallery "Nina Art Gallery". From March 23 to 31, the continuation of the exhibition project "Multifaceted Russia". The project was previously presented in the Russian representations of Germany (Berlin), Czech Republic (Prague), Great Britain (London). Katerina Popushoy exhibition "My City". C 25 March to 1 April 2017, in a concert and exhibition hall "The house Naschokina" All-Russian Society for Protection of Monuments of History and Culture, will open the solo exhibition "My City", in "Fragments of Reality" project, artist, member of the Moscow Union of Artists and the Creative Union of artists of Russia, Catherine Popushoy. 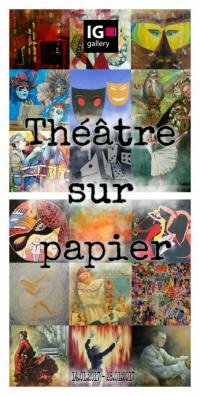 Exhibition "Theatre on paper" in Paris. 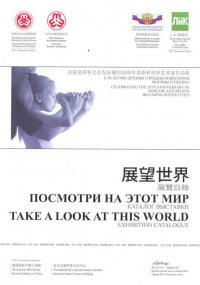 Paris France 14-28 January Exhibition "Theatre on paper,"
Exhibition of young Russian artists, "Look at this world" in Beijing. The National Museum of Women and Children in China will host an exhibition of works by young Russian artists, "Look at the world." 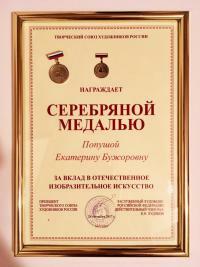 The exhibition dedicated to the 20th anniversary of the twinning between Moscow and Beijing. Moscow fund creative youth support "L&K"
Exhibition opening: October 20, at 9:30 am, 3rd floor. The exhibition "The collective conscious. The dialogues with the classics" Kazan Kremlin, the National Art Gallery "Hazine". Represents a continuation of the exhibition project "collective conscious. The dialogues with the classics," Fellows Ministry of Culture 2015. From March 11 to April 30. National Gallery of Art "Hazine".